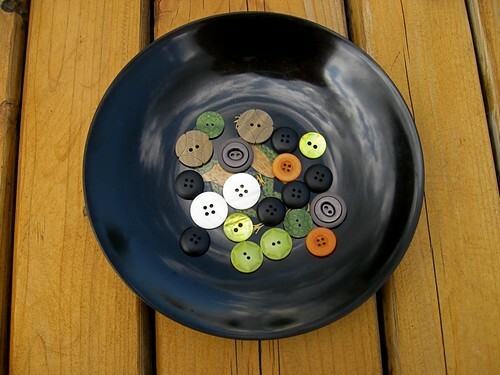 Lately, I've looked at longingly at my button bowl. The stash boasts of mostly mediocre with a few homeless treasures. Old thrift store finds, some are antique I think. The red three-flower one is meant for the kitchen cloth in progress. The three purple buttons with the stitch-y look are my favorites but I haven't made something that deserves them yet. Maybe the Bee Bopper bag, which waits in my queue. So I went on a little button-buying binge this week. For 50 cents a pair, I found some practical buttons at Joann Fabrics this week. I think the rounded black buttons are destined to be pupils for the Yoshi hats I'm working on. Lastly, I finished my market bag. Of course, I made it too long. It seem to be my thing, lately, to make purses and such much longer than they need to be. So snap – it's folded in half to look normal. Unsnapped, it could come in handy for all that poster shopping I don't really do. Which brings me to the end of my button binge. To pretty up the bag and make the snaps look like they belong, I ordered my first buttons from Polka Dot Cottage today. I've been meaning to make a purchase someday anyway. 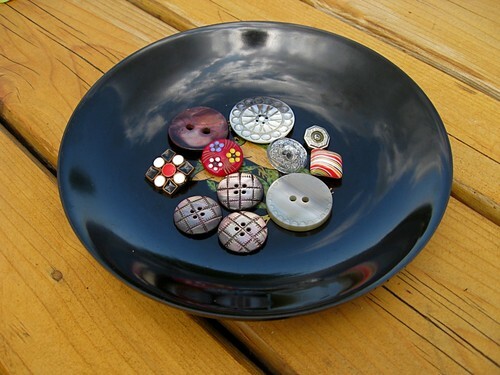 She creates very creative polymer clay buttons. The colors combinations are amazing! And I already waited too long for some pink-green buttons (the ones in the upper left corner). I pictured them as the eyes of my knit bunny WIP but the button pair has since sold out. Back to the bag ... her swamp colors looked like a perfect match. Now I get to eagerly check the mailbox everyday until they arrive. Then the market bag is off to the market with me. Don't hate me for telling you this, but the buttons are sitting in my living room right now. I've been trying to get them on their way since TUESDAY but for some reason, it suddenly became Grand Central Station around here this week. I love having my kids home for the summer, but sometimes it gets to be *crazy* ! Anyway, they're all packed up and weighed, and I'm putting them in the mail TODAY, so you should have them early next week. Thanks for blogging about them, and as far as those pink & green buttons go, they may still turn up again someday! :-) It's ok! I saw you tweet about how busy you were earlier this week. I understand how life gets in the way of our hobbies sometimes. I was soooo kicking myself for missing the pretty pink stripe ones! But the knit bunny is nowhere near done so I can be patient in case they return. And then I'll pounce!